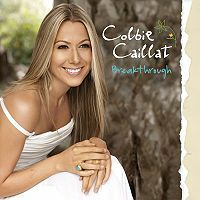 Breakthrough is the second studio album by Colbie Caillat. The album was released on August 25, 2009 in the United States through Universal Republic. The first single "Fallin' for You" was released in June 30, 2009 and was a success on the Billboard Hot 100, reaching 12. The album made its debut at number one on the Billboard 200. "You Got Me" was featured on the 2010 films Leap Year and Letters to Juliet and also on the TV series Melrose Place. "Fallin' For You" is on the soundtrack of the movie starring Jennifer Lopez and Alex O'Loughlin, The Back-Up Plan, on the soundtrack of the Brazilian soap opera Viver a Vida and was also featured on Ghost Whisperer. "Begin Again (Instrumental)" was featured on Life Unexpected. "I Won't" was featured on One Tree Hill and on the series Pretty Little Liars.